﻿ E-ink-Reader. The review of electronic books NOOK SIMPLE TOUCH. The majority of Americans and Englishmen at a word combination "the electronic book" imagine Amаzon Kindle, however model NOOK Simple Touch of the American company Barnes&Noble also is popular, and both in America, and in Europe. The device screen - touch E-ink Pearl, a diagonal of 6 inches. The case is executed from qualitative plastic with a pleasant covering soft-touch, preventing sliding. Pleases module Wi-fi and Internet browser presence. This device supports only PDF and EPUB, is not presented the Russian menu, text wrappings, and also downloading TTF fonts. The book can be bought through an e-commerce shop Barnes&Nobble in the price about 80 US dollars. Despite obvious lacks, this device can be interesting for Russian-speaking users, but at its little unusual use. The majority of electronic books work under operating system LINUX and have the own software, the applications incompatible with other devices. NOOK Simple Touch works with operating system Android and after a updating of the device the special program (it is natural, with guarantee loss), access to desktop Android opens. Thus the electronic book turns into almost high-grade tablet with E-ink screen. After that on NOOK Simple Touch the program for reading of books Coolreader, supporting almost all text formats, text wrappings, folders on a flash card, and also many other Android-appendices and games are started. And they can be loaded and established directly from a network the Internet. Recently there was a new model of the device Nook Simple Touch with GlowLight for sale. Outwardly it hasn't differences from Nook Simple Touch. Besides all characteristics of pregoing model, Nook Simple Touch with GlowLight it is supplied by light-emitting diode illumination of the screen for reading in the darkness. Brightness of illumination can be regulated from zero to a maximum. Consumption of energy by the device with illumination inclusion increases strongly. At the maximum brightness of the screen of the battery of the reader suffices approximately about 15 hours. Advantages of a design and equipment: The screen of last generation, the strong, thin beautiful case, the American quality and reliability. Design and equipment flaws: Poor equipment. The cover is got separately. Advantages of the software:Simplicity and reliability, fonts with a mode "smoothing", support Wi-Fi. Software flaws: Few supported text formats (FB2 - does not read), Are not present supported Folders on a flash card. Incomplete russification - is not presented Russian carryings over. Are not presented downloading fonts. Various variants of firmware: Reception ROOT of access on NOOK Simple Touch. 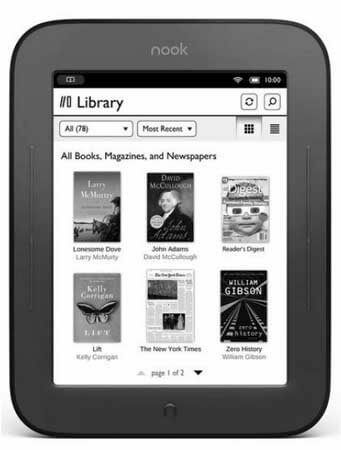 Selection of resources of the Internet about Nook Simple Touch is in section "Links."